The book's recipes are simple, many made from seafood available right outside the restaurant's front door, like Lucinda's Baked Oysters and Kachemak Bay Blue Mussels. The directions indeed read like a conversation with a cook, with gentle reminders to keep an eye on the amount of liquid in the mussel pot, and to be careful not to overcook the cioppino. Far more than a simple cookbook, Beck's vibrant artwork takes up about half the pages in the 48-page book and provides the segue stories about the unusual aspects of living in Halibut Cove, such as gathering your own coal from the beach and clamming in the middle of the night when winter's minus tides fall. Marian Beck needed a third hand. She was using her left to steer a skiff through a brisk August morning, returning from a run to a neighbor’s garden to cut lettuce and leeks. 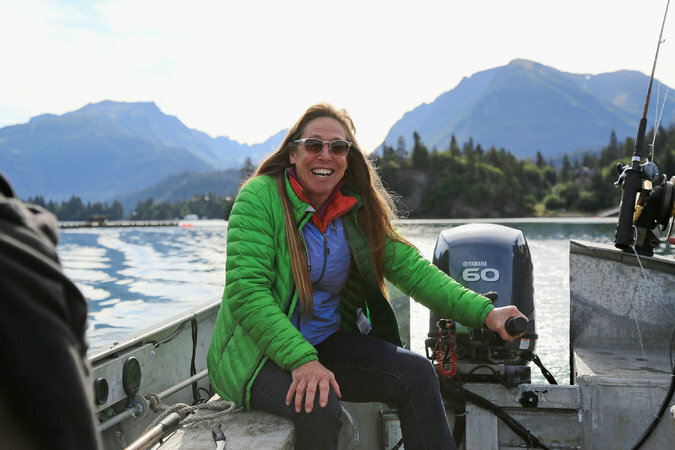 With her right, she was reaching across the water to grab a sack of frilled Glacier Point oysters from Weatherly Bates, who grows oysters and mussels just offshore from Ms. Beck’s restaurant here, the Saltry. Then her cellphone buzzed with a message from the mainland, reporting a problem with that day’s wine delivery. To get the best meal of my life, I flew 4,550 miles from Boston to Anchorage, Alaska, then another 221 miles to Homer. Also called "The End of the Road," Homer sits in the southern reach of the Kenai Peninsula. 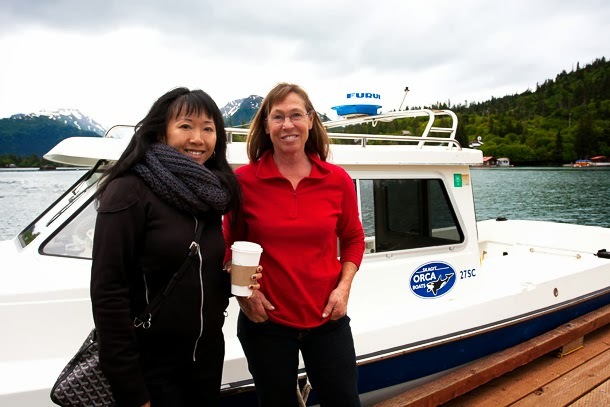 But Homer isn't the end of the road for me: My destination— a small restaurant in a small village on a small island—requires hopping a fishing-boat-turned-ferry called the Danny J and skimming five and a half more miles across the Kenai's Kachemak Bay. Then climbing a steep harbor ramp and winding path, which finally deposits me on the patio of The Saltry, high above glistening Halibut Cove. I am here. I am hungry. And I am ready to eat. Tucked away in a small quarter of Halibut Cove Alaska, is a restaurant called the Saltry. Constructed from a restored boat, with a cozy outside dining area, every piece of the Saltry has a bit of story and whimsy. Open for a select number of months out of the year, and nestled on the boardwalk, charter boats and commercial water taxis are prohibited from entering the cove, so you have to reserve a seat on the restaurant's boat (The Danny J). Alaska’s tourism industry experts say it appears we’re on track for another banner year. They also say the seeds for this year’s success were planted in advertising dollars spent several years ago. Their message: success doesn’t happen overnight. Alaska has also had a boost from TV reality shows. Although the content is not always authentic, the beautiful images in the backdrop have kept Alaska on the forefront of travelers’ minds. Twice a day, the Danny J leaves from Homer, Alaska, crossing the 12 miles of Kachemak Bay to a cliffside restaurant on stilts known as The Saltry. For 32 years, owner Marian Beck has served up halibut, oysters, and, yes, wild salmon that’s caught in the surrounding waters. Life is seasonal here on Alaska’s coast: If winter is long and dark, then summer makes up for lost time­—or does away with it completely. Cell service can be spotty, and this far north, the sun seems to only consider setting.